The first half of December, from a PPC advertiser’s perspective, is a great time. The quality of traffic increases due to the fact that more and more people are shopping online to buy Christmas gifts for others. We are in a generation, at the moment, completely dominated by technology. Christmas is not only a time of holiday. It is beneficial time of year for PPC. Christmas brings alot of benefits to PPC which are constantly making it the best way to advertise online. With gifts such as the new iPad Mini being released near Christmas, there will be millions of people around the world gaining many technological presents which can access the internet. Therefore, Christmas enables more people around the world to gain access to the world wide web where PPC is at it’s heart. More people on the web means more potential traffic that can flow through your PPC campaign. There is an argument that Christmas does not benefit PPC campaigns though. As a blogger, I have found that the traffic to my website decreases by up to 50% during the days before and after Christmas. During Christmas itself, PPC campaigns will find it harder to maintain a high level of conversions from the fact that many people are enjoying Christmas offline with their family and friends. 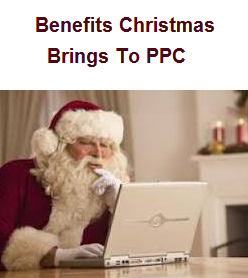 In the long term, Christmas benefits PPC. However, in the short term, it is a big hinderer causing many web users to switch from online to offline. The above benefit looks at the effect of Christmas as it happens. During the build-up, there are lots of benefits PPC can take serious advantage of. There is a strong stereotype amongst people that everything is just that bit cheaper on the internet than in store. For that reason, many people would rather shop online for gifts than take the time to go to the actual store to then find the item they want to purchase is overpriced compared to the internet. This is where advertisers can take advantage of Christmas. In December there are lots of people online wanting to buy gifts. Some know what they want to buy. On the other hand, others don’t and simply want to find a good gift through Google. Using PPC, you can take this traffic to your landing page (if you are selling a product or service) to turn them into a sale conversion. The conversion rate in December is always that bit higher than any of month for that exact same reason. Therefore, you can afford to increase your overall budget and CPC more to accommodate the higher quality and conversion success traffic. Although it is a sad fact to know Christmas Eve is the quietest day online of the whole year, the benefits Christmas brings to PPC far outweigh the drawbacks. Yes, you will find the traffic you gain to your landing page may fizzle out a bit after Christmas day (which you can prevent through the use of a contingency plan telling you exactly how to increase the traffic again). However, the increased internet usage Christmas brings is long term: you will notice the difference next year more than anything.